The 116th Congress made history Thursday, swearing in the most diverse group of lawmakers ever and more than 100 women in the House, including the first two Native American women, the first two Latina women from Texas and the first two Muslim women. The 116th Congress made history Thursday, swearing in the most diverse group of lawmakers ever and more than 100 women in the House, including the first two Native American women, the first two Latina women from Texas and the first two Muslim women. The first-ever African-American women congressmembers from Connecticut and Massachusetts were sworn in, as was Colorado’s first-ever African-American member of Congress. 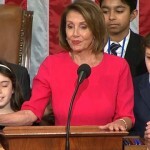 The first-ever and now second female House speaker, Nancy Pelosi, and House Democrats sought to end the government shutdown as their first order of business, passing a package of spending bills that would reopen the federal government without meeting Trump’s demand for $5 billion for expanding the wall on the U.S.-Mexico border. We speak with California Rep. Judy Chu. As the government shutdown heads into its 14th day and Trump doubles down on his demands for a border wall, we turn to look at the ongoing crisis unfolding at the U.S. border and the protesters on the ground fighting back. In West Texas, immigrant rights activists are staging daily actions to shut down the Tornillo prison camp, where thousands of immigrant youth are being detained. The organizers call themselves the “Christmas in Tornillo” occupation. On New Year’s Eve, they shut down the entrance of the sprawling prison camp, where 2,300 children are being held in more than 150 tents. Juan Ortiz is an immigrant rights activist and lead organizer with the Christmas in Tornillo occupation, and Democratic Congressmember Judy Chu is also interviewed from California.